The ancient peoples of Italy. The vast majority of names of places in Italy today are representations of known tribes that inhiabited the area. It we were to estimate every single tribe that has inhabited the area since man walked the earth it may well total upwards of fifty thousand all lost in history here are but the few that we can trace. The territory of what is now Italy was settled by Neanderthal man in the Lower Palaeolithic, roughly 500,000 years ago. As elsewhere in Europe, the Neanderthals co-existed with Homo sapiens for some time after their arrival ca. 40,000 years ago. Pagan is the designation of non-Judeo religious people, it comes from the middle east where religion is used as a group code for war. The belief designates the group and determines friend or foe. Its idealistic version of the nation state which is not a tradition of nomadic arabs. Pagan is a designation by the Roman Catholic Church, it refers to indigenous and centres around Europe mainly due their sphere of influence. Most people who have a last name that includes -gan have been given that name by the Roman Catholic Church the prefix is the place of birth such Reagan, a pagan from Rae Ireland. Ireland has never been a part of Ancient Rome proper as accepted by the Roman Catholic Church, thus the designation. Pagans have their own beliefs, customs and practices that the Roman Catholic Church has either assimilated, contributed, or replaced but the cast of characters they push on people detract from the varied customs found in Europe. Pagans don't say three hail mary's to be released, that is just gay. Their is a body that calls themselves pagans and they practice aspects of the ancient mystery cults rather than Roman Catholic evilism. Large parts of the mystery cults are practised by Roman Catholics but attributed to their deities. Jesus was born on December the 25, it is also the winter solstice, its applicable to the farming calendar which is the basis of non-urbane centres. The presence of the Homo neanderthalensis has been demonstrated in archaeological findings dating to c. 50,000 years ago (late Pleistocene). There are some 20 such sites, the most important being that of the Grotta Guattari at San Felice Circeo, on the Tyrrhenian Sea south to Rome. Others are the grotta di Fumane (province of Verona), grotta San Bernardino (province of Vicenza) and the Breuil grotto, also in San Felice. Homo neanderthalensis is no longer domaninant. The first Cro Magnon inhabitants of Italy, perhaps coming from a migration started from Apulia, moved across the peninusula, establishing themselves in small settlements far from each one, most on high areas. In November 2011 tests conducted at the Oxford Radiocarbon Accelerator Unit in England on what were previously thought to be Neanderthal baby teeth, which had been unearthed in 1964 from the Grotta del Cavallo, were identified as the oldest modern human remains discovered anywhere in Europe, dating from between 43,000 to 45,000 years ago. Around 12,000 years ago, the diminishing number of big game forced their descendants to populate the coast areas. Modern humans appeared during the upper Palaeolithic. Remains of the Aurignacian variety have been found in the grotta of Fumane, dating to c. 34,000 years ago. 30,000 years of modern humans, Homo sapiens in the area. Some ancient traces and buldings…. Rock Drawings in Valcamonica. The stone carvings of Val Camonica constitute one of the largest collections of prehistoric petroglyphs in the world and are dated beginning in the 8th-6th millennium BC. The collection was recognized by Unesco in 1979 and was Italy's first recognized World Heritage Site. Unesco has formally recognized more than 140,000 figures and symbols, but new discoveries have increased the number of catalogued incisions to between 200,000 and 300,000. The petroglyphs are spread on all surfaces of the valley, but concentrated in the areas of Darfo Boario Terme, Capo di Ponte, Nadro, Cimbergo and Paspardo. In the Stone Age the island of Sardinia was inhabited by people who had arrived there in the Palaeolithic and Neolithic ages from several parts of Europe and the Mediterranean area. The most ancient settlements have been discovered both in Gallura and central Sardinia; later several cultures developed in the island, such as the Ozieri culture. The economy was based on agriculture, animal husbandry, fishing and trading with the mainland. Remains from this period include more than 2,400 hypogeum tombs called Domus de Janas, the 4th millennium BC statue menhirs representing warriors or female figures, and the stepped pyramid of Monte d'Accoddi, near Sassari, which has some similarities with the monumental complex of Los Millares (Andalusia) and the later Talaiots in the Balearic Islands. During this period copper objects and weapons also appeared in the island. The altar of Monte d'Accoddi fell out of use starting from c. 2000 BC, when the Beaker culture, which at the time was widespread in almost all western Europe, appeared in the island. The introduction of bronze from the new people arriving from the mainland brought numerous improvements, such as in agriculture, in which more effective tools could be used, but also in war and hunting. The Bonnanaro culture is the last evolution of the Beaker culture in Sardinia (c. 1800 BC), and shows several similarities with the Bronze-Age Polada culture of northern Italy. These have been connected to link with the Italian prehistoric settlements through Corsica. To this period date the construction of the platformlike so-called proto-nuraghe. The Remedello culture (Italian Cultura di Remedello) developed during the Copper Age (ca. 3400 - 2800 BC) in Northern Italy, particularly in the area of the Po valley. The name comes from the town of Remedello (BS) where several burials were discovered in the late 19th century. The Remedello culture is associated in the traditional historiography with the first identified wave of Indo-European peoples who entered in Italy and settled in the Po Valley. The Gaudo culture is a neolithic culture from Southern Italy, primarily in the region of Campania, active at the beginning of the 3rd millennium BC, whose typesite necropolis is located near Paestum, not far from the mouth of the river Sele. It is sometimes described as an eneolithic culture, due to its use of primitive copper tools. The Elymians (Greek Ἔλυμοι, Latin Elymi) were an ancient people who inhabited the western part of Sicily during the Bronze Age and Classical antiquity. 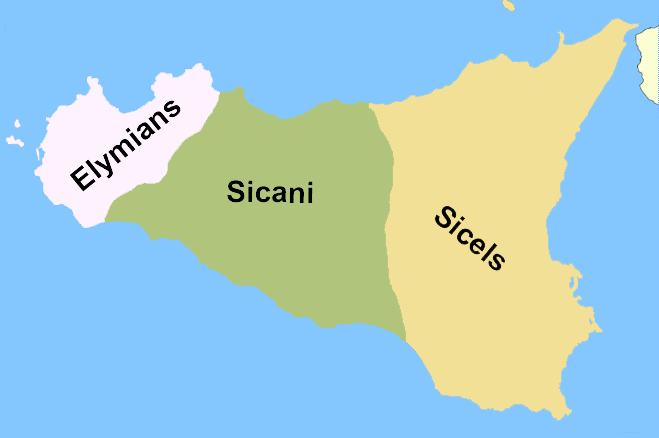 Their neighbors, the Sicani and the Sicels, in Sicily around 11th century BC (before the arrival of the Phoenicians and the Greeks). The Euganei (fr. Lat. Euganei, Euganeorum; cf. Gr. εὐγενής (eugenēs) 'well-born') is a semi-mythical proto-Italic group that dwelt an area among Adriatic Sea and Rhaetian Alps. Subsequently, they were driven by the Adriatic Veneti to an area between the river Adige and Lake Como, where they remained until the early Roman Empire. They were very ethnically related with the Ingauni Ligurians, as proved by the similarity of the names. According to Pliny the Elder the Stoni people from Trentino were of the same stock as the Euganei. Cato the Elder, in the lost book of Origines, counted among the major tribes Euganeans the Triumplini of Valtrompia and the Camunni of Val Camonica. According to Livy they were defeated by the Adriatic Veneti and the Trojans. Their descendants settled west of the Athesis (Adige) river, around the lakes Sebinus, Edrus, and Benacus, where they occupied 34 towns, which were admitted by Augustus to the rights of Latin cities. The Ligures (singular Ligus or Ligur; English: Ligurians, Greek: Λίγυες) were an ancient Indo-European people who gave their name to Liguria, a region of north-western Italy. According to Plutarch they called themselves Ambrones, but this does not necessarily indicate a relationship with the Ambrones of northern Europe. The Picentes or Picentini (Ancient Greek: Πίκεντες, Πικεντῖνοι) were an Italic tribe who lived in Picenum in the northern Adriatic coastal plain of ancient Italy. The Beaker culture From late-3rd to early-2nd millennium BC (ca. 2400 – 1800 BC) use of bronze smithing, in the Padan Plain, in Tuscany and on the coasts of Sardinia and Sicily. The Sherden (also known as Serden or Shardana) are one of several groups of “Sea Peoples” who appear in fragmentary historical records (Egyptian inscriptions) for the Mediterranean region in the 2nd millennium B.C. Up until recently sea trips could be fatal for many or all crew. If one need not to go by ocean then one would certainly not. 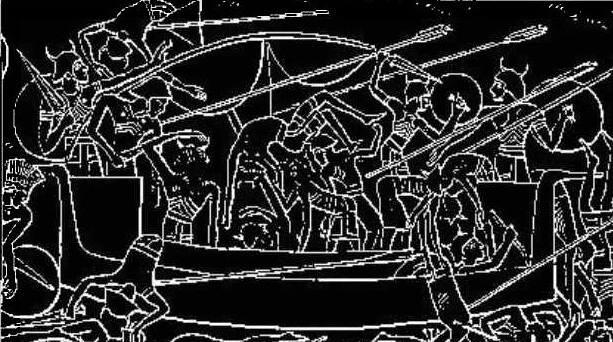 The sea peoples developed navies out of extreme necessity just like the British that have no choice but to fare the sea. The sea peoples then originate with either the peoples of the Aegean Islands or the peoples of the Mediterranean Islands. The late Bronze Age (15th-13th centuries BC) saw a vast migration of the so-called sea people, described in ancient Egyptian sources. They destroyed Mycenaean and Hittite sites and also attacked Egypt. According to some scholars the Sherden, one of the most important tribes of the sea peoples, are to be identified with the Nuragic Sardinians. Another hypothesis is that they arrived to the island around the 13th-12th century after the failed invasion of Egypt. However, these theories remain controversial. A lost work by Simonides of Ceos reported by Zenobius, spoke of raids by Sardinians against the island of Crete, in the same period in which the Sea People invaded Egypt. This would at least confirm that Nuragic Sardinians frequented the eastern Mediterranean Sea. Further proofs come from 13th century Nuragic ceramics found at Tiryns and in the Agrigento area in Sicily, along the sea route linking western to eastern Mediterranean. The Nuragic civilization was a civilization of Sardinia, lasting from the Bronze Age (18th century BC) to the 2nd century AD. The name derives from its most characteristic monuments, the nuraghe. They consist of tower-fortresses, built starting from about 1800BC. Today some 7,000 nuraghi dot the Sardinian landscape. Throughout the second millennium and in the first part of the first millennium BC, Sardinia was inhabited by the single extensive and uniform cultural group represented by the Nuragic people. Centuries later, Roman sources describe the island as inhabited by numerous ethnic groups which had gradually merged culturally. They however maintained a political identity, and were often warring each other for the control of the most valuable territories. Tribes mentioned include the Iolei or Ilienses, the Balares, the Corsi and the Civitatas Barbarie, the latter living in what is now Barbagia and defying the Romanization process. The Balares have been identified with the Bonnanaro culture, deriving from the Beaker culture, and were most likely of Indo-European origins. They lived in what are now the Nurra, Coghinas and Limbara traditional subdivisions of Sardinia. They were of the same stock from which the Talaiotic culture of the Balearic Islands originated. The Ilienses, identified by the scholars with a group coming from the Eastern Mediterranean (and perhaps with the aforementioned Sherden), lived in what is now central-southern Sardinia. Their mythical hero was Sardus, known among the Romans as Sardus Pater. The current name of the island comes from the latter's one. The Corsi lived in Gallura and later colonized Corsica. They have been identified as the descendants of the Arzachena culture. 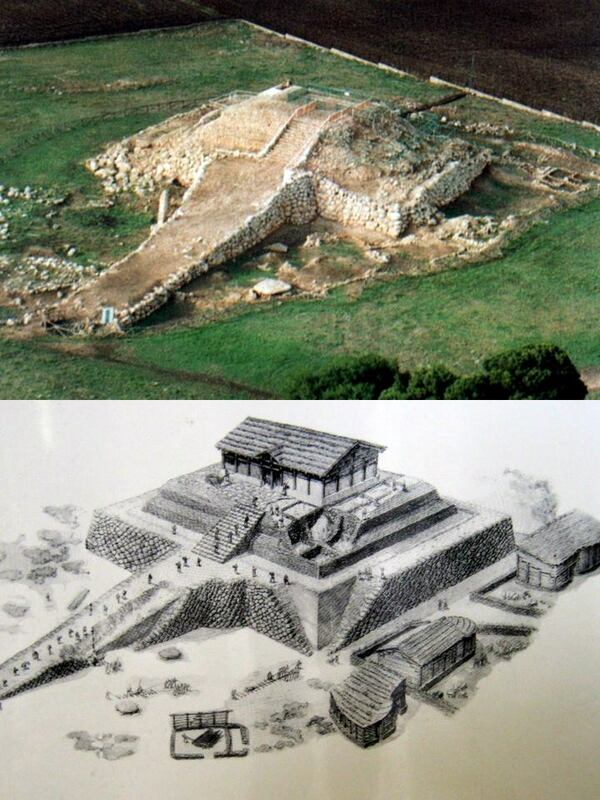 In southern Corsica, in the 2nd millennium BC, the Torrean civilization developed alongside the Nuragic one. The Sicani (Greek Σικανοί Sikanoi) or Sicanians were one of three ancient peoples of Sicily present at the time of Phoenician and Greek colonization. The other the Elymians and the Sicels, in Sicily around 11th century BC (before the arrival of the Phoenicians and the Greeks). In the mid-2nd millennium BC, the Terramare culture (ca. 1700-1150 BC.). The Terramare culture takes its name from the black earth (terremare) residue of settlement mounds, which have long served the fertilizing needs of local farmers. The occupations of the terramare people as compared with their Neolithic predecessors may be inferred with comparative certainty. They were still hunters, but had domesticated animals; they were fairly skillful metallurgists, casting bronze in moulds of stone and clay, and they were also agriculturists, cultivating beans, the vine, wheat and flax. From the late 2nd millennium to the early 1st millennium BC, the Iron Age Proto-villanovan culture (ca. 1100 - 900 BC), related to the Central European Urnfield culture, developed iron-working. Proto-villanovans practiced cremation and buried the ashes of their dead in pottery urns of distinctive double-cone shape. Proto-villanovan settlements has been found in almost all the Italian peninsula from Veneto to eastern Sicily (Milazzo). The most important settlement excavated are those of Frattesina in Veneto region, Bismantova in Emilia-Romagna and near the Monti della Tolfa, north of Rome. In Campania, a region where inhumation was the general practice, proto-villanovan cremation burials have been identified at Capua, at the “princely tombs” of Pontecagnano near Salerno (finds conserved in the Museum of Agro Picentino) and at Sala Consilina. The later Osco-Umbrian, Veneti (and possibly the Latino-Faliscans too) have been associated with this culture. In Tuscany and in part of Emilia-Romagna the proto-villanovan culture was followed by the Villanovan Culture, often associated with the non-indoeuropean Etruscans. Etruscan civilization is the modern English name given to a civilization of ancient Italy in the area corresponding roughly to Tuscany, western Umbria, and northern Latium. The ancient Romans called its creators the Tusci or Etrusci. Their Roman name is the origin of the terms Tuscany, which refers to their heartland, and Etruria, which can refer to their wider region. In Attic Greek, the Etruscans were known as Τυρρηνοὶ (Tyrrhēnioi), earlier Tyrsenoi, from which the Romans derived the names Tyrrhēni (Etruscans), Tyrrhēnia (Etruria), and Mare Tyrrhēnum (Tyrrhenian Sea). The Etruscans called themselves Rasenna, which was syncopated to Rasna or Raśna. As distinguished by its unique language, this civilization endured from the time of the earliest Etruscan inscriptions (ca. 700 BC) until its assimilation into the Roman Republic in the 1st century BC. At its maximum extent, during the foundational period of Rome and the Roman kingdom, it flourished in three confederacies of cities: of Etruria, of the Po valley with the eastern Alps, and of Latium and Campania. Culture that is identifiably Etruscan developed in Italy after about 800 BC approximately over the range of the preceding Iron Age Villanovan culture. The latter gave way in the 7th century to a culture that was influenced by Greek traders and Greek neighbours in Magna Graecia, the Hellenic civilization of southern Italy. After 500 BC the political destiny of Italy passed out of Etruscan hands. Figure shows the villanovan settlement 900BC existed prior to the Rasenna. The Raeti (name variants: Rhaeti, Rheti, or Rhetii) was the collective “ethnic” name used by the ancient Romans to denote a number of Alpine tribes, whose language and culture may have derived, at least in part, from the Etruscans. From not later than ca. 500 BC, they inhabited the central parts of present-day Switzerland and the Alpine regions of north-central Italy. In the 13th century BC proto-Celts (probably the ancestors of the Lepontii people) coming from the area of modern day Switzerland, eastern France and south-western Germany entered in Northern Italy (Lombardy and eastern Piedmont) starting the Canegrate culture whom not long time after, merging with the indigenous, and originally Pre-Indo-European, Ligurians, produced the Golasecca culture. Falisci (Ancient Greek: Φαλίσκοι) is the ancient Roman exonym for an Italic people who lived in what was then Etruria, on the Etruscan side of the Tiber River. The region is now entirely Lazio. They spoke an Italic language, Faliscan, closely akin to Latin. Originally a sovereign state, politically and socially they supported the Etruscans, joining the Etruscan League. This conviction and affiliation led to their ultimate near destruction and total subjugation by Rome. The Latins (Latin: Latini) were an Italic tribe who included the early inhabitants of the city of Rome. From about 1000 BC, the Latins inhabited the small region known to the Romans as Old Latium (Latium Vetus), that is, between the river Tiber and the promontory of Monte Circeo (60 mi or 100 km SE of Rome). The Sicels (Latin: Siculi; Greek: Σικελοί) were an Italic people who inhabited ancient Sicily. The Sicels gave Sicily the name it has held since antiquity, but they rapidly fused into the culture of Magna Graecia. Marsi is the Latin exonym for an Italic people of ancient Italy, whose chief centre was Marruvium, on the eastern shore of Lake Fucinus, drained for agricultural land in the late 19th century. The area in which they lived is now called Marsica. During the Roman Republic the people of the region spoke a language now termed Marsian in scholarly English. It is attested by several inscriptions and a few glosses. The Linguist List classifies it as one of the Umbrian Group of languages. The Umbri were an Italic tribe of ancient Italy. A region called Umbria still exists and is currently occupied by Italian speakers. It is somewhat smaller than the ancient Umbria. Most ancient Umbrian cities were settled in the 9th-4th centuries BC on easily defensible hilltops. Umbria was bordered by the Tiber and Nar rivers and included the Appennine slopes on the Adriatic. The ancient Umbrian language is a branch of a group called Oscan-Umbrian, which is related to the Latino-Faliscan languages (Buck, 1904). The Volsci were an Italic tribe, well known in the history of the 1st century of the Roman Republic. They then inhabited the partly hilly, partly marshy district of the south of Latium, bounded by the Aurunci and Samnites on the south, the Hernici on the east, and stretching roughly from Norba and Cora in the north to Antium in the south. The Marrucini were an Italic tribe which occupied a small strip of territory around the ancient Teate (modern Chieti), on the east coast of Abruzzo, Italy, limited by the Aterno and Foro Rivers. Other Marrucini centers included Ceio (San Valentino in Abruzzo Citeriore), Iterpromium (whose ruins are under the Abbey of San Clemente at Casauria), Civitas Danzica (Rapino), and the port of Aternum (Pescara), shared with the Vestini. The Osci (also called Opici, Opsci, Obsci, Opicans, Ancient Greek: Όπικοί, Όσκοί), were an Italic people of Campania and Latium adiectum during Roman times. The Aurunci were an Italic tribe which lived in southern Italy from around the 1st millennium BC. Of Indo-European origin, their language belonged to the Oscan group. The Auruncan territory extended south from that of the Volsci, in the area of Roccamonfina, between the Liri and the Volturno rivers. The Ausones (Ancient Greek: Αὔσονες; Italian: Ausoni) were an Italic tribe settled in the southern part of Italy. Often confused with the Aurunci, they share with them only a probably common origin. The Campanians (also Campani) were an ancient Italic tribe, part of the Osci groups, speaking an Oscan language. Descending from the Apennines the proto-Osci settled in the areas of present day Campania at the beginning of the 1st millennium BC, or even before. From the 7th to the 5th century BC, Greek colonists submitted or expelled them from the area but, starting from the mid of the 5th century BC, the Osci reconquered many cities on the coasts of present day Province of Caserta, Naples and Low Latium as also most of the inland. Amongst those reconquered cities there were Cumae (taken from the Greeks) and Capua (from the Etruscans). The Paeligni or Peligni were an Italic tribe who lived in the Valle Peligna, in what is now Abruzzo, central Italy. The Sabines (/ˈseɪbaɪn/; Latin: Sabini; Ancient Greek: Σαβῖνοι) were an Italic tribe that lived in the central Appennines of ancient Italy, also inhabiting Latium north of the Anio before the founding of Rome. The above names, English, Latin and Greek, are all exonyms. The Sabines divided into two populations just after the founding of Rome, which is described by Roman legend. The division, however it came about, is not legendary. The population closest to Rome transplanted itself to the new city and united with the pre-existing citizenry, beginning a new heritage that descended from the Sabine but was also Latinized. The second population remained a mountain tribal state, coming finally to war against Rome for their independence, along with all the other Italic tribes, losing, and being assimilated into the Roman Republic. The Bruttii (Greek: Βρέττιοι, Italian: Bruzi), were an ancient Italic tribe people who inhabited the southern extremity of Italy, from the frontiers of Lucania to the Sicilian Straits and the promontory of Leucopetra, roughly corresponding to modern Calabria. The Frentani were an Italic tribe occupying the tract on the east coast of the peninsula from the Apennines to the Adriatic, and from the frontiers of Apulia to those of the Marrucini. They were bounded on the west by the Samnites, with whom they were closely connected, and from whom they were originally descended. The Lucani (Lucanians) were an Italic tribe living in Lucania, who spoke an Oscan language, a member of the Italic languages. The Samnites were an Italic people living in Samnium in south-central Italy who fought several wars with the Roman Republic. The Samnites were an Oscan-speaking people, and they were probably an offshoot of the Sabines. 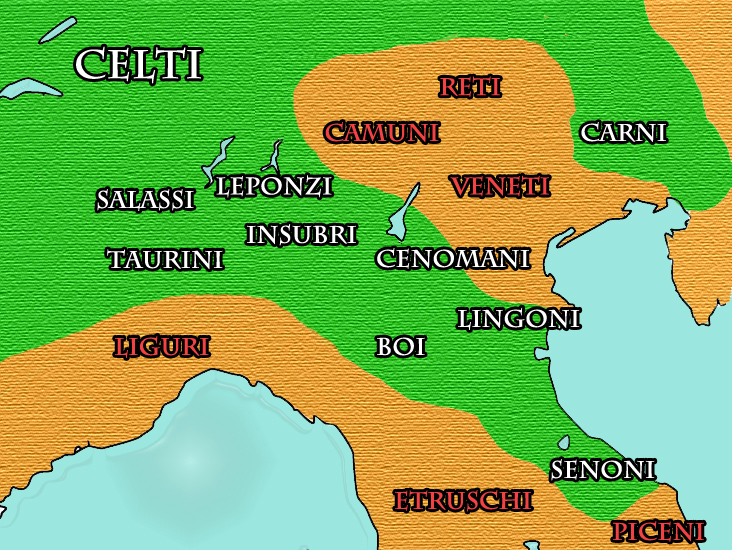 The Samnites formed a confederation of the tribes Hirpini, Caudini, Caraceni, and Pentri. They were allied with Rome against the Gauls in 354 BC, but later became enemies of the Romans and were soon involved in a series of three wars (343–341, 327–304, and 298–290) against the Romans. Despite a spectacular victory over the Romans at the Battle of the Caudine Forks (321), the Samnites were eventually subjugated. Although severly weakened, the Samnites later helped Pyrrhus and Hannibal in their wars against Rome. They also fought from 90 BC in the Social War and later in the civil war as allies of Gnaeus Papirius Carbo against Lucius Cornelius Sulla, who defeated them and their leader Pontius Telesinus the Battle of the Colline Gate (82 BC). By 82 BC, the Roman dictator Lucius Cornelius Sulla conducted an ethnic cleansing campaign against then Sabines, after which they disappeared from history. The Caraceni or Caricini or Carricini (Greek: Καρακηνοὶ or Καρίκινοι) were a tribe of the Italic Samnites. According to Ptolemy, they inhabited the most northern part of Samnium, bordering on the Peligni and the Frentani; but more especially the upper valley of the Sagrus (modern Sangro). The only city that he assigns to them is Aufidena. Zonaras describes them as possessing a town or stronghold, which was taken by the Roman consuls Q. Gallus and C. Fabius with difficulty. Aufidena has been identified with the modern Castel di Sangro, which seems, from the inscriptions and other remains discovered there, to have been an ancient town. The Caudini were a Samnite tribe that lived among the mountains ringing Campania and in the valleys of the Isclero and Volturnus rivers. Their capital was at Caudium, but it seems certain that the appellation was not confined to the citizens of Caudium and its immediate territory. Livy speaks in more than one passage of the Caudini as a tribe or people, in the same terms as of the Hirpini, and Niebuhr supposed them to have been one of the four tribes comprising the Samnite confederacy As the most western of the Samnite groups, they were the Samnite tribe most affected by the neighbouring Greeks of Campania. The Hirpini (Greek: Ἱρπινοί), were an ancient Samnite people of central Italy. While general regarded as having been Samnites, sometimes they are treated as a distinct and independent group. They inhabited the southern portion of Samnium, in the more extensive sense of that name, roughly the area now known as Irpinia from their name—a mountainous region bordering on Basilicata towards the south, on Apulia to the east, and on Campania towards the west. The Aequi (Ancient Greek: Αἴκουοι and Αἴκοι) were an Italic tribe of northeast Latium and the central Appennines of Italy who appear in the early history of ancient Rome. After a long struggle for independence from Rome they were defeated and substantial Roman colonies were placed on their soil. Only two inscriptions believed to be in the Aequian language remain. No more can be deduced than that the language was Italic. Otherwise the inscriptions from the region are those of the Latin-speaking colonists in Latin. The colonial exonym documented in these inscriptions is Aequi and also Aequicoli (“colonists of Aequium”). The manuscript variants of the classical authors present Equic-, Aequic-, Aequac-. If the form without the -coli is taken as an original, it may well also be the endonym, but to date further evidence is lacking. Fidenae, or Fidenes, home of the Fidenates, was an ancient town of Latium, situated about 8 km north of Rome on the Via Salaria, which ran between Rome and the Tiber. As the Tiber was the border between Etruria and Latium, the left-bank settlement of Fidenae represented an extension of Etruscan presence into Latium. The site of the arx of the ancient town was probably on the hill on which lies the contemporary Villa Spada, though no traces of early buildings or defences are to be seen; pre-Roman tombs are in the cliffs to the north. The later village lay at the foot of the hill on the eastern edge of the high-road, and its curia, with a dedicatory inscription to M. Aurelius by the Senatus Fidenatium, was excavated in 1889. Remains of other buildings may also be seen. The Hernici were an Italic tribe of ancient Italy, whose territory was in Latium between the Lago di Fucino and the Sacco River (Trerus), bounded by the Volsci on the south, and by the Aequi and the Marsi on the north. The Picentes or Picentini (Ancient Greek: Πίκεντες, Πικεντῖνοι) were an Italic tribe who lived in Picenum in the northern Adriatic coastal plain of ancient Italy. The endonym, if any, and its language are not known for certain. Vestini (Ancient Greek: Ὸυηστίνοι) were an Italic tribe who occupied the area of the modern Abruzzo (central Italy) included between the Gran Sasso and the northern bank of the Aterno river. Their main centres were Pitinum (near modern L'Aquila), Aufinum (Ofena), Peltuinum (Prata d'Ansidonia), Pinna (Penne) and Aternum (Pescara, shared with the Marrucini). The Carni (Greek Καρνίοι) were a tribe of the Eastern Alps in classical antiquity, settling in the mountains separating Noricum and Venetia. They are usually considered a Gaulish tribe, although some associate them with the Venetic peoples, a group closely related to but probably distinct from the Celts. Their area of settlement isn't known with precision. Strabo confines them to the mountains, while Ptolemy assigns them two cities near the Adriatic coast. They are likely eponymous of the regions of Carnia, Carniola and Carinthia. The first historical date related to the arrival of the Carni is 186 BC, when some 50,000 Carni, composed of armed men, women and children, descended towards the plains (in which they previously used to winter) and on a hill they founded a stable defensive settlement, Akileja. The Cenomani or Aulerci Cenomani were a Gallic people, a branch of the Aulerci in Gallia Celtica, whose territory corresponded generally to Maine in the modern départment of Sarthe, west of the Carnutes between the Seine and the Loire. Their chief town was Vindinum or Suindinum (corrupted into 'Subdinnum'), afterwards Civitas Cenomanorum (whence Le Mans) and later Cenomani as in the Notitia Dignitatum, the original name of the town, as usual in the case of Gallic cities, being replaced by that of the people. According to Caesar (Bell. Gall. vii.75.3), they assisted Vercingetorix in the great rising (52 BC) with a force of 5000 men. Under Augustus they formed a civitas stipendiaria of Gallia Lugdunensis, and in the 4th century part of Gallia Lugdunensis III. Lingones were a Celtic tribe that originally lived in Gaul in the area of the headwaters of the Seine and Marne rivers. Some of the Lingones migrated across the Alps and settled near the mouth of the Po River in Cisalpine Gaul of northern Italy around 400 BC. These Lingones were part of a wave of Celtic tribes that included the Boii and Senones (Polybius, Histories ii.17). The Lingones may have helped sack Rome in 390 BC. The Gaulish Lingones were thoroughly Romanized by the 1st century, living in a rich and urbanized society in the region of Langres and Dijon and minting coins, but getting caught up in the Batavian rebellion (69 CE), described by Tacitus. The Senones (Ancient Greek: Σήνωνες) were an ancient Gallic tribe. In about 400 BC they crossed the Alps and, having driven out the Umbrians settled on the east coast of Italy from Forlì to Ancona, in the so-called ager Gallicus, and founded the town of Sena Gallica (Senigallia), which became their capital. In 391 BC they invaded Etruria and besieged Clusium. The Clusines appealed to Rome, whose intervention, accompanied by a violation of the law of nations, led to war, the defeat of the Romans at the Allia (18 July 390BC) and the capture of Rome. The Graioceli were an Gaulish tribe whose lands lay in the upper valley of Maurienne (France) and in the vicinity of Alpis Graia (modern Little St Bernard Pass), as well as in adjoining sections of northwestern Piedmont (Italy) in the Graian Alps. The Lepontii were an ancient people occupying portions of Rhaetia (in modern Switzerland and northern Italy) in the Alps during the time of the Roman conquest of that territory. The Lepontii have been variously described as a Celtic, Ligurian, Raetian, and Germanic tribe. Recent archeological excavations and their association with the Golasecca culture of Northern Italy may point to a Gaulish affiliation, although an amalgamation of Rhaetians (who were partly of Etruscan-related origin) may not be excluded. The Salassi were an Gaulish tribe whose lands lay on the Italian side of the Little St Bernard Pass across the Graian Alps to Lyons, and the Great St Bernard Pass over the Pennine Alps. They were finally defeated and many enslaved in 25 BC by the Romans, who founded the city of Augusta Praetoria Salassorum, modern Aosta, in their territory. 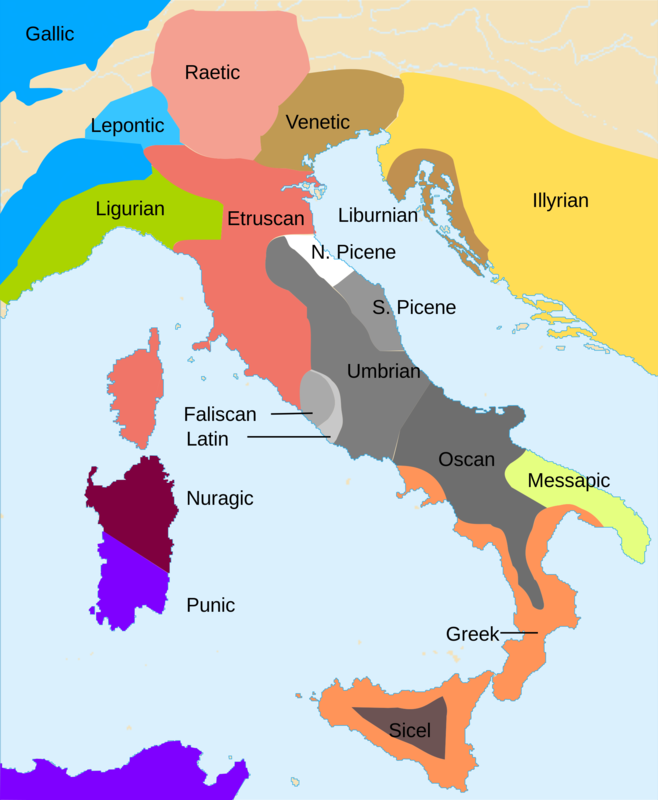 The Ligures (singular Ligus or Ligur; English: Ligurians, Greek: Λίγυες) were an Indo-European people who gave their name to Liguria, a region of north-western Italy. The Insubres were a Gaulish population settled in Insubria, in what is now Lombardy. They were the founders of Milan (Mediolanum). Though ethnically Celtic at the time of Roman conquest (at the beginning of the 2nd century BC), they were most likely the result of the fusion of pre-existing Ligurian, Celtic and “Italic” population (such as the Golasecca culture) strata with Gaulish tribes who had come from what is now southern France. The Laevi, or Levi were a Ligurian people in Gallia Transpadana, on the river Ticinus, who, in conjunction with the Marici, built the town of Ticinum (the modern Pavia). The Taurini were an ancient Gallo-Ligurian people, who occupied the upper valley of the river Po, in the centre of modern Piedmont. The Lombards or Langobards (Latin: Langobardī), were a Germanic tribe who ruled a Kingdom in Italy from 568 to 774. The Franks (Latin: Franci or gens Francorum) were a confederation of Germanic tribes first attested in the third century AD as occupying land on the Lower and Middle Rhine. In the 3rd century some Franks raided Roman territory, while others joined the Roman troops in Gaul. The Goths (Gothic: *Gut-þiuda, Gutans; Old Norse: Gutar/Gotar; German: Goten; Latin: Gothi; Greek: Γότθοι, Gótthoi) were an East Germanic tribe, whose two main subgroups, the Visigoths and the Ostrogoths, played an important role in the fall of the Roman Empire and the emergence of Medieval Europe. The Normans (in French: Normands; in Latin Nortmanni; in German: Normannen) were the people who gave their name to Normandy, a region in northern France. They were descended from North Germanic Norse Viking conquerors of the territory and the native population of Germanic Frankish and Gallo-Roman stock. Their identity emerged initially in the first half of the 10th century, and gradually evolved over succeeding centuries. The Italiotes (Greek: Ἰταλιῶται, Italiōtai) were the pre-Roman Greek-speaking inhabitants of the Italian Peninsula, between Naples and Sicily. Greek colonization of the coastal areas of southern Italy and Sicily started in the 8th century BC and, by the time of Roman ascendance, the area was so extensively hellenized that Romans called it Magna Graecia, “Greater Greece”. The Siceliotes (singular and adjectival form: Siceliot), formed a distinct ethno-cultural group in Sicily from about the 8th century BC until their assimilation into the general Sicilian population. The Iapyges (Greek: Ἰάπυγες) or Iapygians were an Indo-European people who inhabited the heel of Italy (modern Apulia) before being absorbed by the Romans. The Messapians or Messapii were an Indo-European people that inhabited, in historical times, the south-eastern peninsula or “heel” of Italy (Salento, modern Apulia), known variously in ancient times as Calabria, Messapia and Iapygia. Their chief towns were Uzentum (modern Ugento), Rudiae (modern Lecce), Brundisium (modern Brindisi) and Hyria. They spoke the Messapian language. They are often referred to as “the most southerly of the Iapygian tribes”. The Peucetii (or Poedicli, according to Strabo) were a tribe who were living in Apulia, southern Italy, in the country behind Barion (Latin Barium, modern Bari). They are traditionally one of the tribes of the Iapygian civilization. They had three important towns: Canosa, Silvium and Bitonto; the present capital of Apulia: Bari had not much importance. The Daunia is a historical and geographical region in Apulia, southern Italy, mostly coincident with modern Province of Foggia. In ancient times, together with Peucetia and Messapia it formed the Iapygia. The Veneti (also called heneti in Latin, ἐνετοί enetoi in Greek) were an Indo-European people who inhabited north-eastern Italy, in an area corresponding to the modern-day region of the Veneto. The Liburnians (or Liburni, Greek: Λιβυρνοί) were an ancient Illyrian tribe inhabiting the district called Liburnia, a coastal region of the northeastern Adriatic between the rivers Arsia (Raša) and Titius (Krka) in what is now Croatia. Histri (Greek: Ιστρών έθνος) were an ancient tribe, which Strabo refers to as living in Istria, to which they gave the name. 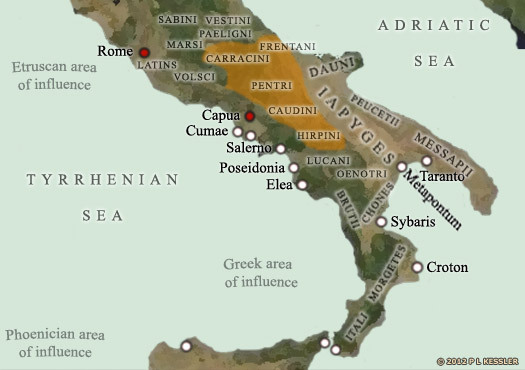 The Oenotrians (“tribe led by Oenotrus” or “people from the land of vines - Οἰνωτρία”) were an ancient Italic people of unknown origin who inhabited a territory from Paestum to southern Calabria in southern Italy. By the sixth century BC, the Enotrians had been absorbed with other Italic tribes. The Rutuli or Rutulians (ancient italic Rudhuli, «the red ones» with the meaning of «the blond ones») were members of a legendary Italic tribe. The Rutuli were located in territory whose capital was the ancient town of Ardea, located about 35 km southeast of Rome. Thought to have been descended from the Umbri and the Pelasgians, according modern scholars they were more probably connected with the Etruscan or the Ligurian peoples. These groups spoke many different separate languages and many dialects not relating to Latin or Italian and along with writing are unique to the area.